On 25 March 2018, Sunday, a fire broke out in the Winter Cherry shopping centre, claiming numerous victims. Sixty-four people, mostly children, have died. 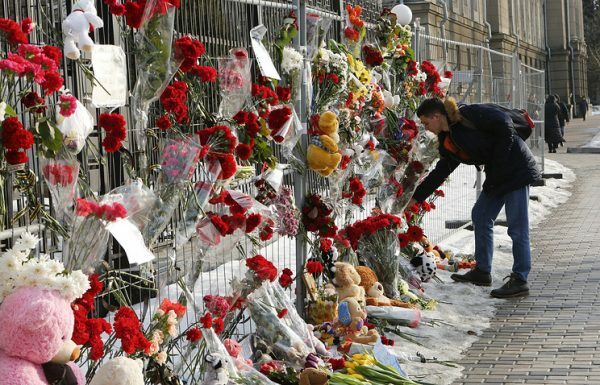 March 28 was declared national day of mourning in Russia. Messages of condolences keep coming to His Holiness Patriarch Kirill of Moscow and All Russia from the Primates of the Local Orthodox Churches. It is with a heavy heart that we learned of the devastating news concerning the fire in the Winter Cherry shopping centre, which took the lives of so many people – both children and adults. We are at a loss for words witnessing the unfathomable tragedy which the mass media has conveyed, and we remain in prayerful contemplation for the victims and their family members. As we journey towards Christ’s triumphant entry into Jerusalem, we grieve as our Lord did for the death of His good friend, Lazarus, while holding within us the assurance of the Resurrection and the promise of the life to come. In the season of Lent, when people of God are preparing to celebrate the Radiant Resurrection of Christ – and it is already next Saturday that we will commemorate the raising of Lazarus of the Four Days – we have received the terrible news that in the city of Kemerovo people died and were injured in the fire that broke out in the shopping centre. Your Holiness, please accept the most sincere and profound condolences over this tragedy from the plenitude of our Local Church. We are praying for the soonest recovery of the injured, for the consolation of those who lost their relatives and friends, especially children, and for the repose of the souls of the innocent victims. We believe that the All-Merciful Lord will raise the souls of His servants, granting them life eternal.